Hearing God’s voice is as simple as quieting yourself down, fixing your eyes on Jesus (vision), tuning into flow or spontaneity and writing (journaling). All these 4 keys are found in Habakkuk 2:1,2. Sometimes we are so busy we don’t have time to journal. But if we were to journal, we’d be more effective and less busy because the Lord would tell us the things we really don’t need to do that day. There are things we do need to do, others are unnecessary from God’s perspective. It is important to start our day off with the Lord, connecting with Him. To live out of communion with God, live out of flow, rather than be driven by rules, guilt and need. “Good morning Lord, what are we doing today?” He can give us directives for the day. Gen. 3:8 It has always been God’s plan for people to hear His voice just like He walked with Adam and Even in the garden in the cool of the day. God wants to restore this intimacy. Deut 5:22-31 God was offering His voice and relationship with His people. But they weren’t willing due to fear of God’s fire. They turned God down. Moses got a relationship with God while the people of Israel got the laws. Heb 12:25 Do not refuse Him who is speaking. Phil 3:10 Oh, that we might KNOW Him. 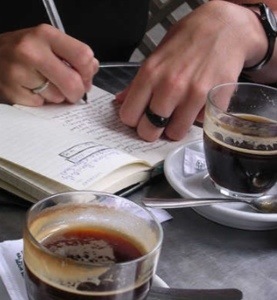 Two way journaling is as simple as you expressing yourself, maybe ask a question. Picture Him there with you and share your love with Him and write what He says back to you. More on learning how to hear God’s voice and journaling. I love the way Jesus speaks when I take the time to write to Him. He’s the best Friend I’ve ever had. Isn’t He though? Its a matter of taking the time to write and He will answer. It is so sweet.